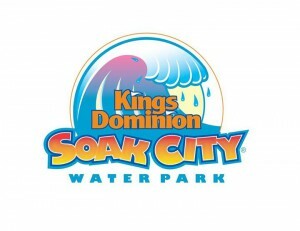 DOSWELL, VA (February 5, 2015) – The 40th Celebration continues at Kings Dominion as WaterWorks transforms into Soak City. An expansion and renovation of Kings Dominion’s all-inclusive water park is well underway. • A 65-foot tall slide tower that features three thrilling attractions, each one providing a unique riding experience. Paradise Plunge sends thrill-seekers into an almost vertical free fall as the floor drops out from underneath their feet. On Aqua Blast, riders are sent twisting and spiraling through an enclosed chute featuring 360-degree turns. Thunder Falls launches riders in a tube down a series of intense drops and turns. 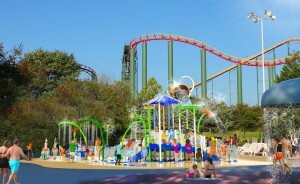 • Splash Island, a new children’s area that will double the size of the current children’s options in the water park. The family-friendly splash zone will create a magical play environment for children of all ages and abilities. Features include small slides for young children and multiple jets of streaming water that spray up from the ground, as well as overhead. Splash Island allows family members to play, socialize and enjoy the water park experience together. • Improved Guest Amenities: Upgraded family changing areas, an additional restroom complex, expanded deluxe cabanas featuring WiFi and television, and new restaurant concepts designed by Kings Dominion’s Executive Chef. • The Soak City makeover will include an updated entrance area and landscaping throughout the 20-acre water park. Kings Dominion would love for you to weigh in! Starting Thursday, February 5, you can visit our park’s Facebook page to help name the new mega slide tower that will be home to Paradise Plunge, Aqua Blast, and Thunder Falls. Vote for either Hurricane Heights or Tsunami Summit. Voting ends at midnight on Monday, February 9. The name with the most fan votes will be officially announced on Tuesday, February 10. Soak City is set to open in the spring of 2015 making this the first expansion at Kings Dominion’s water park since 2007. Guests who want to be among the first to experience these exciting additions at the park can purchase 2015 Kings Dominion Season Passes now. Passholders enjoy many benefits, including: Bring-A-Friend discounts, food and merchandise discounts, and early access to select rides and the water park. 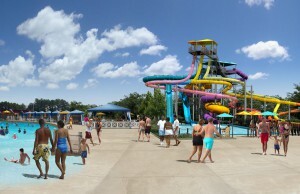 Soak City is included with general park admission. The 2015 season begins on Sunday, March 29. For more information visit www.kingsdominion.com. THE ABOVE INFORMATION IS FROM A KINGS DOMINION PRESS RELEASE ON FEBRUARY 5, 2015.